On the inside, there’s not much to see. But that’s OK, because it’s about the sound. The last few days has not been so visually exciting, but much has been accomplished. 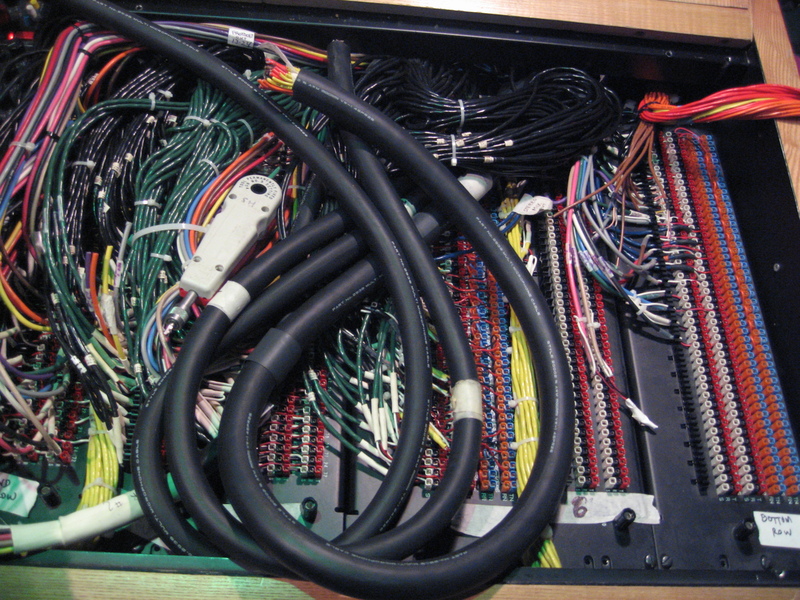 While Jay was tearing apart the patch bay and verifying where all of the wires were going, I was trying to get all the gear moved around into the 3 racks we have … and redesigning the patch bay several ( or 4 or 5) times, as we found out what was there and how “it’s usually done” according to Jay, who’s done it a number if times. 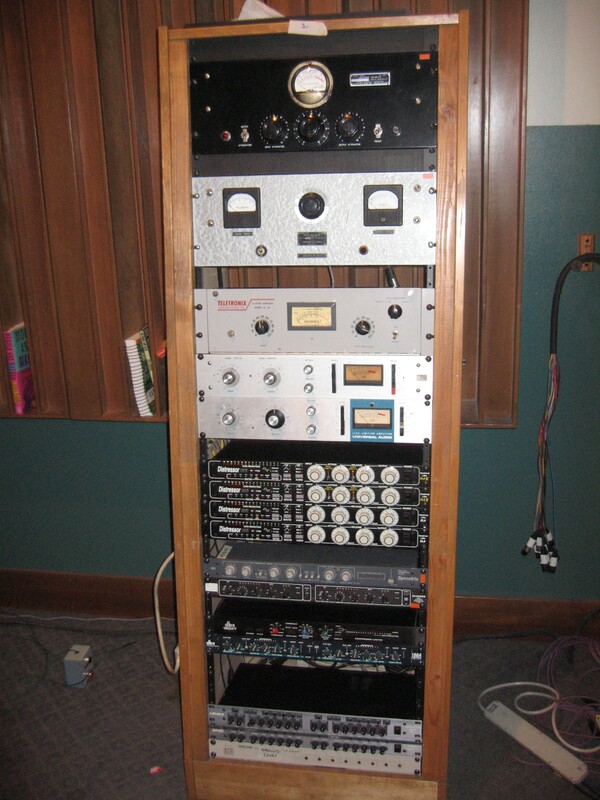 The Processing Rack full of Yummy Vintage Gear. 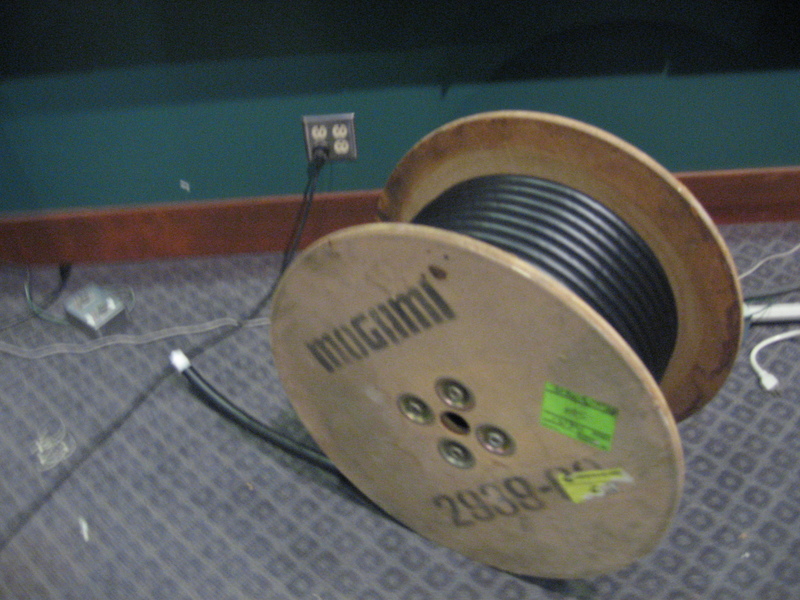 Was 250 feet of 48pr Mogami wire. A little shorter now. OK. Gotta go back to work! I started pulling things off the racks today, didn’t get very far but tomorrow we roll up our sleeves and really dig into things. Just installed the new 500 Watt Bryston for the giant Tannoys! … and cranked it to 11. Oh, yeah, rock. AND roll! It’s the Bryston 4B SST. A monster. A Beast. Eric Howk (Lashes) is in Soundhouse right now assisted by Eric Corson and John Roderick (The Long Winters). This is day 3. This morning Eric C said things were going well … “we’re ahead”. At least I think he didn’t mean, “we’re a head”. 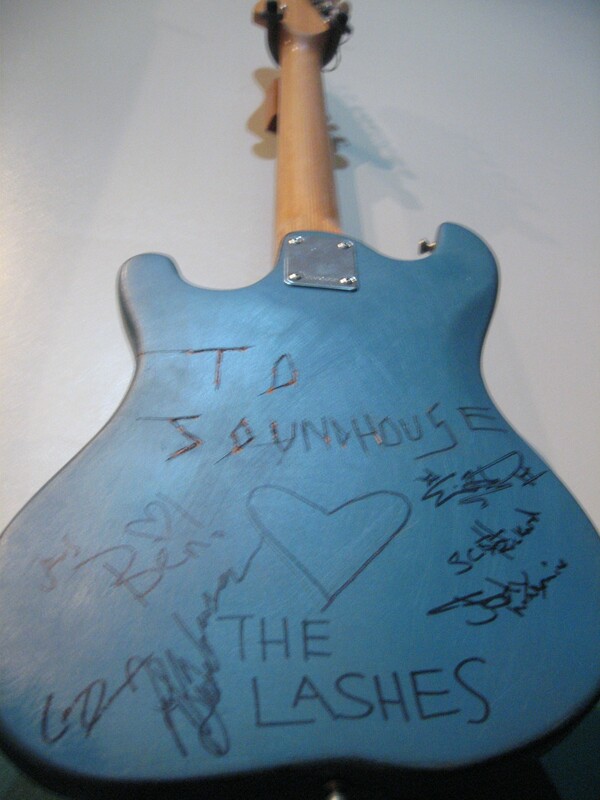 A gift from the Lashes! 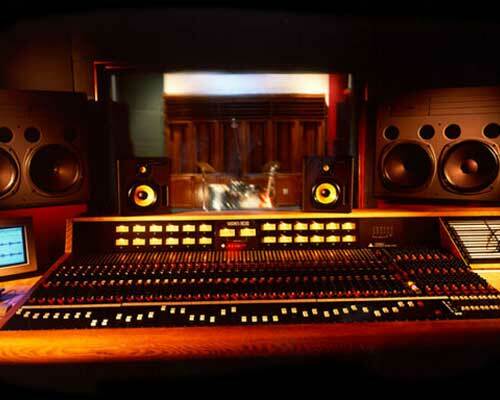 Soundhouse got a new toy. You will be pleased, it’s an update long overdue. Last month we installed the new ProTools 9 rig with new Mytek 8×192 converters! I took it for a test run – recording at 176.4 kHz – without a hiccup (Except for one error that we later realized was caused by writing to the system disk!) with Seattle band Lark Vs. Owl. Jack says, “I love it”. You will, too. 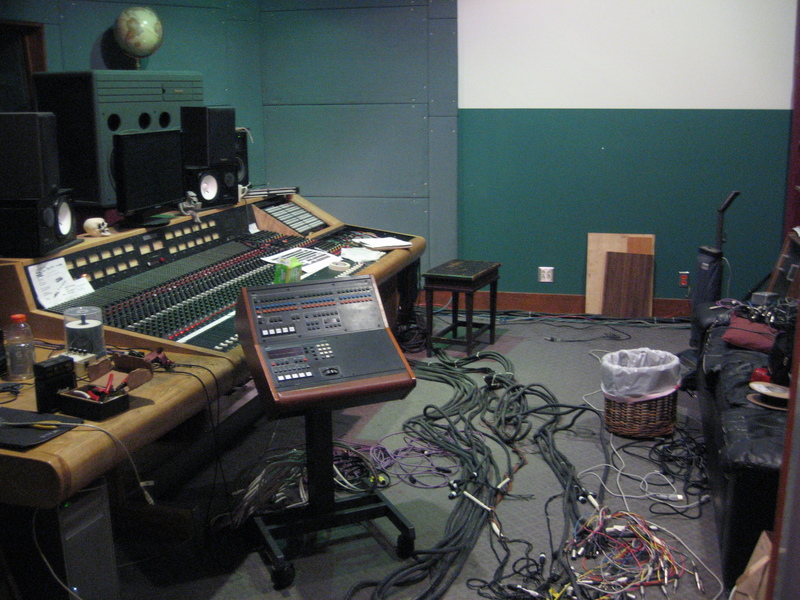 Of course, we still have the [lonely] Studer 24 track. Oh, excuse us, we’re not quite dressed! If you’ve come to this page, please come again! A little later we’ll have a party with snacks and drinks and the like, but right now we’re in the midst of getting ready and you’ve caught us with our pants down!